Bopup Communication Server is a secure messaging suite designed to provide efficient and private communication over networks of any size. The server meets most of the critical business needs, such as centralized management, the Active Directory (LDAP) support, message & file logging, messaging groups, user permissions. It can be easily deployed over the business infrastructure to unite the entire company's offices into one internal IM workspace. Akeni Web Chat is an IM system with its browser based client there is no need to install any client side software. It is also firewall friendly and can be used whenever you have access to a web browser. The rich client supports chat, notification and conferencing. This product can be deployed as a stand alone HTTP server. 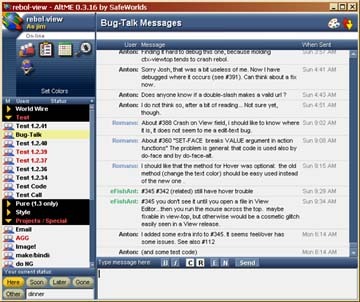 AltME - The Alternative Messaging Environment is a communication system with private chat rooms, messaging forums, and instant applications like checklists & calendars. It downloads and runs on your own PC where you are the master with full control over users. Security is provided through encrypted data transfer and authenticated user logon. AltME has a built-in update feature so you are always running the most current version. PINO is a TCP/IP based client/server chat system for Windows. PINO 3 is the client application. PINO 3-Server is the central server software managing the individual user connections, verifying user authorizations and ensuring general security. ChatSpace Community Server is a real-time communication tool. It contains an array of real-time community and support applications including chat, live events, queued help and instant messaging.